Each month I will describe sights of interest in the night skies of South Carolina. These sights will be broken down into three sections; what you can see with the naked eye, with binoculars, and with a small telescope. The best time to view the night sky is at and around the times when the Moon is not visible, what is known as a New Moon; which will occur this month on October 26th. For October, your best viewing nights will be from October 1st and 2nd and October 19th to the 29th. 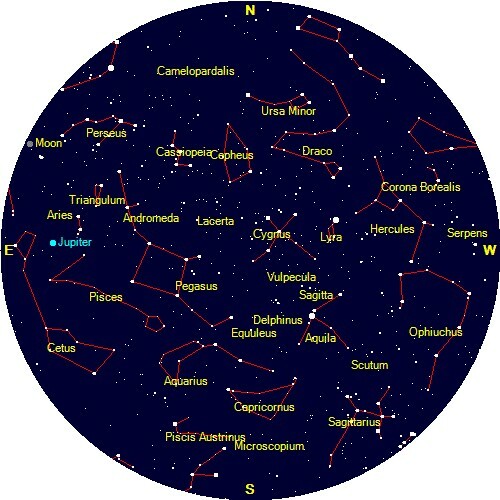 The Star chart below is set for Florence, SC on October 15th at 9 pm. Jupiter returns this month and is a great target for your telescopes. The two favorite planets for small telescope observation are Saturn and Jupiter. Saturn is usually the most impressive target because of its beautiful ring system, and Saturn will return next spring. Jupiter is known for its atmospheric cloud bands, red spot (not very red), its four major moons, and its large disk size. This month Jupiter moves into opposition with the Earth on October 28th. Opposition occurs when the planet is directly opposite the Sun as seen from Earth. (Lunar opposition is called a full Moon). At opposition, the planet is visible the entire night. Also at opposition, the planet is at its closest distance to Earth. However, due to variability in its orbit, it can be closer or farther away each year. Jupiter is 369 million miles from Earth this month, which is quite close. Jupiter can only be 3 million miles closer than it is now. 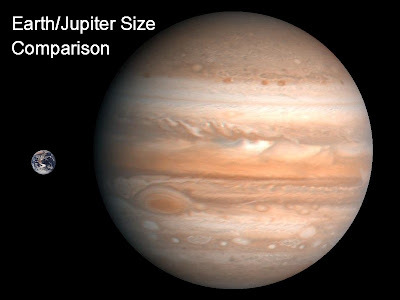 However, Jupiter can be as much as 44 million miles farther from us at opposition; that is greater than the distance between the Earth and Mars! Although Jupiter opposition occurs at the end of the month, Jupiter will continue to be impressive from October into early March 2012. Therefore, Jupiter will be the brightest star like object throughout the winter. Another plus is that late fall and winter skies tend to give clearer viewing due to the lack of humidity/moisture in the atmosphere. Telescope Viewing: The very bright Jupiter, strangely enough may result in viewing problems for amateurs. Most amateur astronomers cannot afford to purchase refracting telescopes with highest quality lenses. These high quality lenses are called apochromatic, and can easily add an additional $1000 or more to the price of a good refracting telescope. 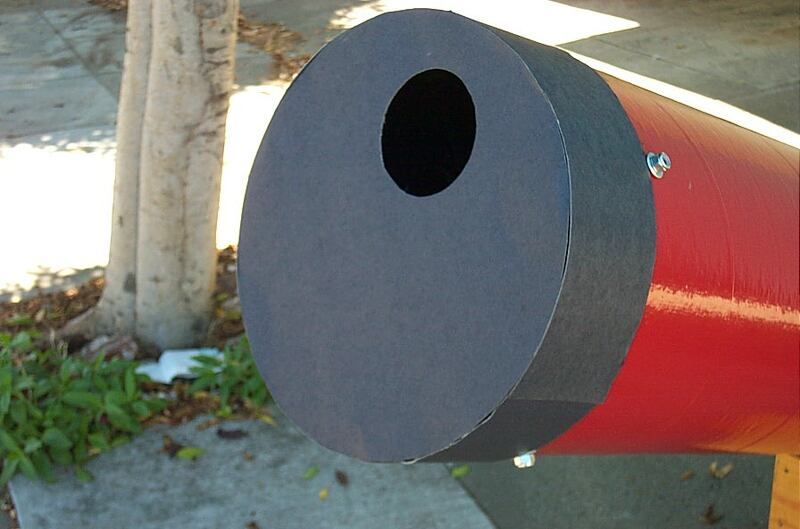 With standard quality telescopes, very bright objects do tend to cause some viewing problems. This can also occur with reflecting telescopes. Sometimes this can be resolved by “masking” the objective lens, centered masking with a refractor and off center masking of the mirror on a reflector, as shown below. The “masks” allows only a small amount of the available light to enter your telescope. This may seem strange, because you chose your telescope to collect as much light as possible, but remember, masking is only used in special cases with very bright planets. Note that this planet brightness problem is in part due to the contrast between the bright planet and the dark sky. So another simple trick to enhance your planetary viewing is to look at the planet earlier in the night, during twilight, before total darkness arrives. This trick also works quite well when viewing Venus. Although you can see Jupiter’s moons with binoculars, a simple telescope will allow you to also view the impressive cloud bands of Jupiter. With a simple telescope on a clear night, you may even see the bands in color! 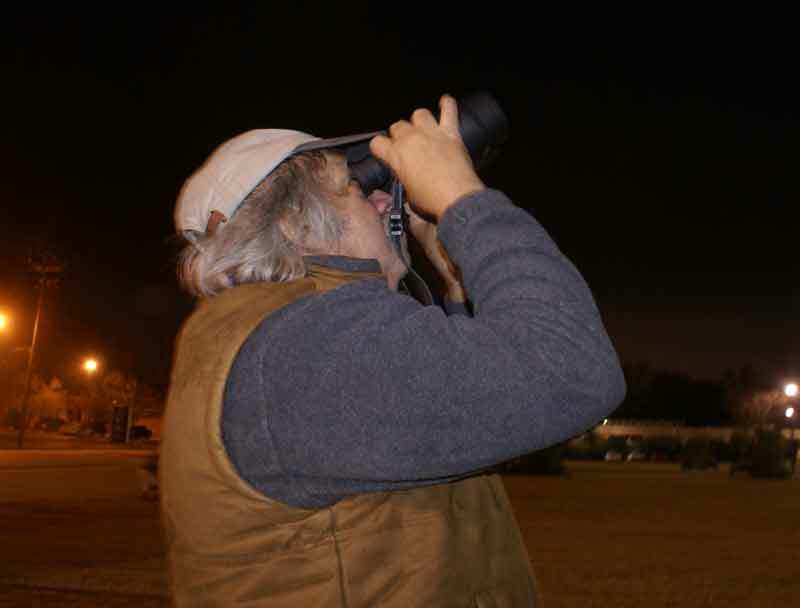 Binocular Viewing: Jupiter is the only planet that can be enjoyed using simple seven or ten power binoculars. With low power binoculars, Jupiter will not be seen as a disk, but its four major moons, Ganymede, Callisto, Europa and Io, known as the Galilean moons, will be readily visible. These moons move quickly around the planet, therefore each night they will be seen in different positions. In addition, some nights they will disappear as they move in front or in back of the planet. So on any given night, you usually see from one to four moons. The image below approximates what I can see through my large binoculars. Note that the cloud bands are just barely visible at 25 power. Some key points about this site. First and most important is the time. This site uses universal time (UT), which is based in Greenwich, England. The time offset is given on the site, and for South Carolina it is -4 hours. 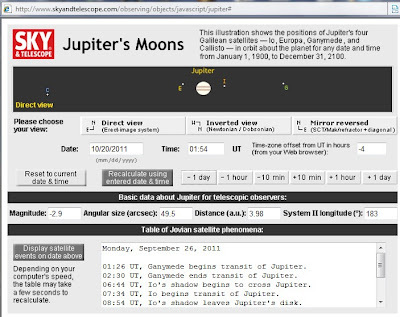 Therefore, the image above shows the position of Jupiter’s moons on 10/20/2011 at 1:54 am minus 4 hours or 9:54 pm on the night of October 19th. Once you get used to this time setup, this site is easy to use. Note: -4 hours is for daylight savings time; in the winter, our time offset will be -5 hours. Next, notice that the default view of the moon positions is called the direct view. This is the view you will see through binoculars. You can click on the other views based on what kind of telescope setup you have. Don’t forget to use the +- day, hour, minute recalculation boxes to adjust for your viewing times. Naked Eye Sights: Jupiter will be the brightest “star like object” this month. Binocular Sights (7 to 10 power): Jupiter and its moons. Check the Galilean moons positions using the Sky and Telescope website, then go out and see them for real. 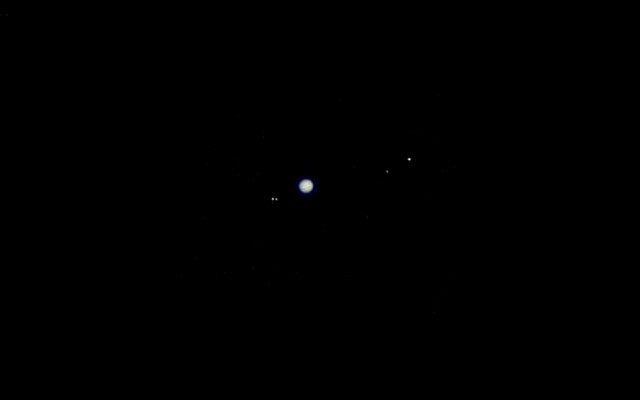 Telescope Sights (60-100mm: Jupiter and its moons. Try some twilight viewing of this planet.